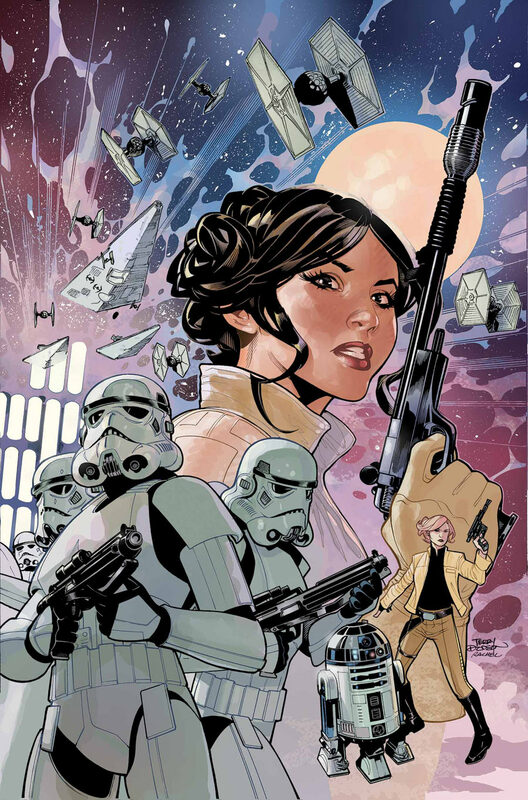 As part of Marvel’s release of new Star Wars comics, one of the several limited runs introduced was Princess Leia. It’s a 5 issue run that covers what Princess Leia was up to after Star Wars: A New Hope. Keep in mind that all Star Wars comics released this last year are part of the official canon. Any comics or books prior will be part of Legends, unofficial story lines. But that’s a different story. With the new and official canon, we have very little information on what happened to the Alderaanians. Writer Mark Waid and artist Terry Dodson cover this gap between episodes 4 and 5. After Pricess Leia and the rebels deliver sweet sweet revenge against the empire, there’s not much time to celebrate. With the destruction of the Death Star, the empire is still very alive and active. Not only that, rumor is that they’re seeking the remaining Alderaanins for reprisal. Since General Dodanna is refusing to give the Princess any real active role in the rebellion for fear that the Empire is trying to capture her, she decided to take it upon herself to gather all the surviving Alderaanians. Without the General’s blessing, she partners up with newly introduced rebel pilot Evaan, another Alderaanian. Oh, also R2-D2 is with them. I love the robot but does R2 really need to be part of every single story line? But I digress. So off they go on an adventure to save their people. This 5 issue run has all the normal customary literary devices. There’s action, betrayal, plot twists, cliffhangers and backstories. Princess Leia stays true to her character in the movie. Only a few major characters make minor cameos, but the story sticks to the objective at hand and does it very well. Finding the Alderaanians and rescuing them. We also learn where the Alderaanians end up calling home at the end of the arc. During this time I was also reading the other comics, Star Wars, Darth Vader, Kanan: The Last Padawan. The Pricess Leia run doesn’t really play much into any of the other story lines. Which is good because it lets the reader isolate several different events in the Star Wars universe. At this point, all we know is that the events currently happening are right after the Death Star’s destruction. I must say, I really did enjoy Princess Leia. Writer Mark Waid did a fine job keeping the story pace just right. He didn’t try to pack too much into 5 issues. I also personally enjoyed Terry Dodson’s art. Maybe I’m just a sucker for epic space battles and beautiful princesses but he didn’t overly sexualize the characters and the art fits in properly with the Marvel universe. So all in all, excellent in all departments and I highly recommend the read. Here’s the thing. If you live, breath and love the Star Wars universe, then these comics are your books. And chances are, you’ve already read it. It’s the official canon. Doesn’t get any more official than that. Now if you’re a casual Star Wars fan of the movies, I still believe it’s a great run. Unlike the other new Star Wars comics that came out the last few months, it’s a short and entertaining read. It doesn’t require a lot of investment and you get to learn about a what happens after a key event in Episode 4. The trade paperback gets releases on November 3, 2015. Pre-order your copy today! Linky.